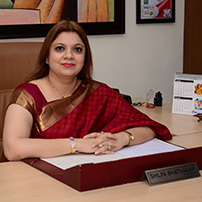 A veteran educationist with long years of experience in school administration Mrs. Shilpa Bhatnagar is the Principal of Bhatnagar International School, Vasant Kunj, New Delhi. Winner of National Resource Optimization Award in view of immense contribution in areas of primary and secondary school education, child care and development; and Global Human Rights Protection Award .Pursuit of excellence is Mrs. Shilpa’s prime endeavour and she joyfully strives for the same in all that she does. The deep passion and igniting desire to make a difference in the lives of the children continue to burn bright in her heart. She leaves no stone unturned to venture into newer and challenging pedagogic territories in a bid to nurture pupils with etiquettes, social graces, moral values and a deep love for our culture ensuring holistic development and academic excellence. Mrs. Bhatnagar’s perpetual aim is to groom a perfect generation with sound mental and physical fitness, and the capability to fully develop their innate potential in the present competitive world as well as a positive attitude towards life. As a successful premiere and inspiring leader, she displays a committed resolve to serve the community at large and has become instrumental in its betterment and upliftment. Mrs.Shilpa has taken up cudgels to promote the literacy drive in the South East Zone of Delhi and has emerged a winner of SufiaAjmali Trophy for the fifth consecutive year since 2012, conferred by Delhi school’s Literacy Project for making maximum number of learners in the impoverished neighbouring slums of Masoodpur which is adopted by the school since its inception. Her commitment to environment upkeep has made her the winner of the Eco-Friendly School of the Year Award. A perfectionist to the core, her zeal for cleanliness and rudiments of hygiene has brought the school the coveted recognition as the Best Hygienic School of The Year Award and Clean School of The Year by National Institution of Cleanliness Education and Research (NICER) on the World Youth Skills Day celebrations. Her collaborative leadership focuses on strategic school-wide actions directed towards improvement in the learning environment. It empowers employees, encourages broad spectrum participation in decision making and fosters shared accountability for student learning.